Over the last five years Montauk has evolved from fisherman and surfers to a hyper-popular beach destination for the New York City summer crowd. As the evolution has occurred, a shift from the original old school spots has taken place with an influx of more modern restaurants, bars, and shops. Our 24-hour guide covers both worlds. Ditch Plains | Photo Credit: Find. Eat. Drink. "It’s a fancy, chill town with a really cool vibe. The beach is just one block away from where I work, so I can take a break, go swimming, and come back to work." "It is an incredibly beautiful place where you can kick back and spend a lot of time doing quiet activities, like read books and take walks. And you are always within five minutes of a beach. Montauk has been modernizing over the last few years, but it still seems locked in time." "Montauk is a beautiful place to be. For a chef, you are literally getting the stuff pulled right out of the water and brought to the restaurant for you." "It is a beautiful seaside town. Sometimes it is hard to believe that you are only three hours outside of New York. The best part about Montauk is that you have the best of both worlds, you can come out and party like a rock star or you can just disappear." Breakfast at Goldberg's Bagels | Photo Credit: Find. Eat. Drink. "They are a local institution on the east end of Long Island. Grab a coffee and an early morning bagel." "For breakfast, I would definitely hit up Joni’s. Healthy, fresh, clean. Really good after a big night out or if you want to get up and go for a surf or hit the beach. It is a great way to start the day with lots of healthy options." "After a long night, nothing beats a breakfast burrito at Joni’s. Eat at one of the picnic tables outside or walk a block to the beach. Joni's also has an excellent smoothie list with extensive additions like goji and maca." "This is a place where I can get something nice and light to eat that will get me through the day. I pick up a smoothie in the morning and sometimes I get their great wrap with brussels sprouts and tuna. Everything is super fresh and delicious. The people who work here are amazing; they are so happy and smiling." "They serve everything organic. There are juices, smoothies, organic local eggs and great healthy dishes. It's a very local vibe and they are open year round, which attracts the locals for sure." Ditch Witch at Ditch Plains | Photo Credit: Find. Eat. Drink. "This is one of my favorite little snack spots. This coffee wagon is an icon at Ditch Plains beach, the popular surfing spot. When I go surfing in the morning, I get a cup of coffee. You can also have lunch here; they make quesadillas and tacos right in the wagon on the sand. It’s very popular so there can be a 40 minute line all day long in the summer." Seafood at Gosman's Market | Photo Credit: Find. Eat. Drink. "All the fish that we buy from Gosman's is amazing, fresh seafood. They have the best products." "This shop is great for wandering around and checking out the local bounty. Not only do they have a wonderful fish selection, but they also have great meat and a lot of vegetables, beautiful olive oils, vinegars, arborio rice, and things like that. If you really want to have a nice dinner at home, shop here." "You can walk through just to see the local seafood since they save the best for their own showcase and they also prepare lobsters that can buy cooked or cook them yourself. They also sell organic meats, vegetables right from the farm, and there's always local corn. It’s great one stop shopping." "Balsam Farms is one sell a tremendous variety of produce. I love their corn, tomatoes, eggplant, peppers, Swiss chard, beets, leeks, carrots - the list is endless. You can basically create a whole meal just by cooking everything there." Lobster Roll at Duryea's Lobster Deck | Photo Credit: Find. Eat. Drink. "Sit here and watch the sun go down and enjoy a lobster bisque and a steamed whole lobster. You'll feel like you have been away for six months." "Come here on a nice sunny day and you'll never want to leave. Order clam chowder and a lobster roll, the most classic Montauk food at the most classic Montauk place." "I head here for lobster rolls. It is a great place. You can sit outside and enjoy your lobster roll with chips and fresh lemonade. It's great for lunch." Crispy Shrimp and Crispy Tile Fish Tacos at La Brisa | Photo Credit: Find. Eat. Drink. Traditional Mexican tacos (meaning the small corn tortilla sized ones) using local fresh seafood from the Montauk docks. The corn tortillas are made on the premises each morning for tacos and chips. Chef Oscar Hernandez recommends ordering the crispy local tile fish tacos with jalapeño mayo and spicy pickled cabbage, as well as their freshly-made juices. "Part of the Tacombi restaurant group, La Brisa brings a bright, coastal Mexican vibe to a busy corner in Montauk’s main square. Enjoy a post-dinner Paloma with fresh citrus and sit at one of their outside tables." Ice Cream Sundae at John's Drive-In | Photo Credit: Find. Eat. Drink. "I am a big diner guy and this is an old school place which has a 1950s burger joint kind of vibe. We get our ice cream for the restaurant from them and are using it for dessert in an ice cream float." "I love their beers. It's local young guys who started it. It has been a huge success and we serve their beer at the Crow’s Nest. Their beers are all over New England. It is nice and fresh and served only in the can. Bring a case of Montauk ale home." "After breakfast, grab a beer flight and nab one of the coveted tables on the outside patio. The bar gets busy shortly after opening, so make sure to arrive early. The seafood joint next door will let beer drinkers use their tables -- just put in a couple orders of calamari and lobster salad.."
View of Lake Montauk from the Crow's Nest | Photo Credit: Find. Eat. Drink. "I really love the ambience, it is absolutely the best in the Hamptons. They also have very good food like nice crudos, which are refreshing." "Really good, local food and they have a wonderful lawn out back to hang out on before dinner. I usually get the whole fluke." "This rustic, Mediterranean type spot delights with its views of the ocean and handwritten menu. Take a stroll along the water while waiting for simple, but eclectic dishes like harissa chicken and beets with pomegranate." Sunset at Montauket | Photo Credit: Find. Eat. Drink. "For sunset in Montauk there is only one spot and that is the Montauket. It has a spectacular sunset year round. You’ll find a real blend of locals hanging out with newcomers who have discovered it. It is a little out of the way on Fort Pond Bay. They serve Montauk Brewing Company beer on tap, both an IPA and a summer ale." "If I want to get a little fancier and have a glass of rosé and watch the sunset, I hit the Surf Lodge. It is a cool spot. The set up is beautiful. It is a great experience. It is so relaxing." "This place is an amazing spot for sunsets. They have a big deck or you can grab a lounger on the beach, get a bottle of rosé, a few lobster rolls and watch the sun go down." "After a nap on the beach, grab a glass of rose, and enjoy the last moments of sun at Navy Beach's waterfront bar." "This is a great local establishment owned by Dave Marcley and they have been here for 25 years. It is very consistent and they serve seafood right off the dock. They have a veteran staff who have been here for a long time, so you know you are going to be treated well." "It is just one of those places with classic service and food in Montauk. It is old school. I get either the cioppino or, if it's available, the surf and turf that comes with a half lobster tail." The Hideaway | Photo Credit: Find. Eat. Drink. "It’s down at the docks, tucked back off the road and you enter through a boatyard. It very much speaks to what the locals do here in that they are slightly removed from the chaos of the vacationers." Swordfish Kebab at Ruschmeyer's | Photo Credit: Find. Eat .Drink. "I love coming here for dinner. The food is great and the setup and ambience are amazing. They also have an fantastic bar." Liar's Saloon } Photo Credit: Find. Eat. Drink. "It’s a local fisherman’s bar out on the docks and it may take awhile for them to warm up to you, but it is a great place to sit and have a beer late night. The magic handshake at Liar's is just keep your head down and play Foosball." "If I want to go local and just grab a beer, I come here. It is a really cool bar right by the docks and I can talk to the locals. 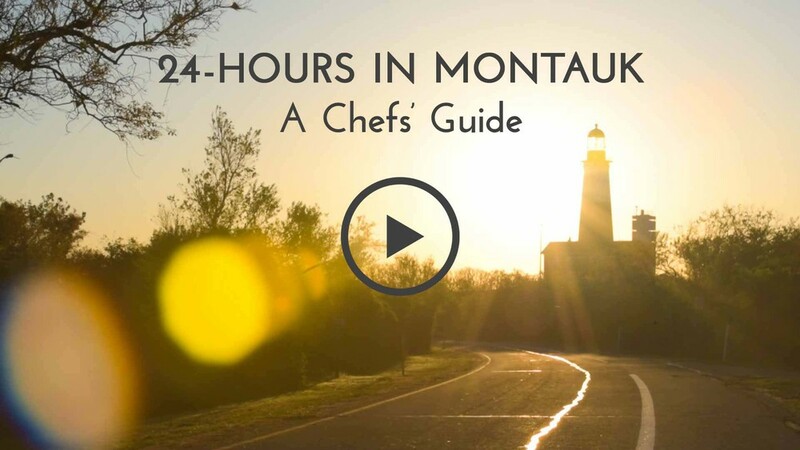 You can really learn what Montauk is about. Most of the fishermen come here fresh off their boats, grab a beer, and tell stories about the day. On the weekends, you’ll find people from the city and it is a beautiful mixture." "I’ve heard that I need to stay away from Liar’s because it is a vortex of restaurant back of house personnel." "This may not be the classiest bar in the Hamptons, but they pour a strong drink and there's nowhere better to dance. The 4am last call is just a suggestion for those wishing to walk home on the beach and watch the sun rise." Pick up some beer at Long Island's eastern most craft brewery which was started in 2012 by three friends. Stop into their tasting room and bring a six pack home. Locally-made sipping rum, hand-crafted and aged in bourbon barrels. It's inspired by Sag Harbor's history of whaling ships that stored the rum in barrels previously used for coffee, exotic spices and fruit. MORE SURFING | Whalebone magazine. BUS | Take the Hampton Jitney, the Luxury Liner, or the Hampton Ambassador. 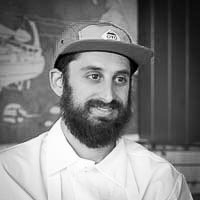 Executive chef at Ruschmeyer's in Montauk and Samesa, Ed and Bevs in Brooklyn. Executive chef at The Surf Lodge in Montauk and Flinder's Lane in Manhattan. 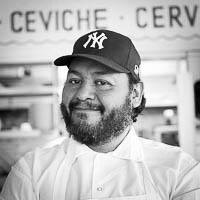 Executive chef at La Brisa in Montauk and Tacombi in Manhattan. Executive chef at the Crow's Nest in Montauk. Executive chef at 668 Gig Shack in Montauk. Executive chef at The Maidstone in East Hampton. Executive chef at LandMarc and Ditch Plains in Manhattan. Operations for Calissa in Water Mill and Amali and Amali Mou in New York City.